Editor's note: This account was in The Kentucky Journal, a Newport newspaper in 1892. It was a two and a half column front-page article. The headlines and the picture from the paper are below. A short article about Pastor D. R. Campbell is added at the bottom. Dedication of the New Church To-morrow. History accredits Thomas Jefferson with saying, "One of the sources from whom which I derived my ideas of a pure government - Democratic in its principles - as expressed in the Declaration of Independence was that of a Baptist Church which met in a log school house in the vicinity of my home during the later years of youth and the first of early manhood." 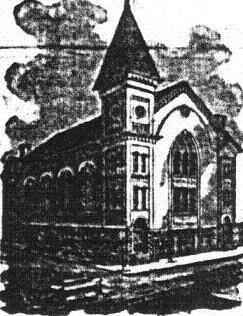 The dedication of the new edifice of the First Baptist Church, of this city, located at the corner of 8th and York Streets, tomorrow, bring before the people the Baptists as a great religious denomination and organized body of Christian workers and life of the individual congregation who will enjoy the comforts of their new and elegant home, made attractive to both members of that "household of faith" and any who may desire to enter the sacred circle of its "common brotherhood." Every appliance that modern art could suggest or delicate taste provide is embodied in the detail of arrangement for the comfort of the congregation, and the elements of attraction have not been over-looked; no pains or expense have been spared to embody the sunshine of cheerfulness and all the departments with the view of "drawing all men" into the circles of religious light as expressed in the design of this temple "where mortals to their maker bend." It is instructive to consider the past that we may better appreciate the magnificent results presented in the present. Some twelve years ago, the former home of this congregation was located on Bellevue, now 4th Street, opposite the Challenge Packing Co. establishment. The building was a plain oblong structure, about 30 x 60 feet, without any display of artistic beauty, elegance or comfort, the more ancient square windows and doors, at the time it was built, it was however, considered one of the great churches in the city. In the auditorium of the old church, the voices of many of the pioneer ministers of the Baptist Churches, of Kentucky, Ohio, and Virginia had been heard. Men who traversed the various sections of the new country on horseback, or on foot, fording streams, sleeping on cabin floors, subsisting on the plainest food, wearing homespun clothing, and alike indifferent to heat or cold, storm or sunshine, prosperity or adversity, only careful for health and strength, to preach the gospel and lead others into the fold. Some of these deserve mention and honor in the exultation of every Baptist as he contemplates the harvest of the seed sown and bread cast upon the waters now returned after years gone by. Uncle Jimmie Vickers as he was familiarly known back in the 30's and 40's by every man, woman and child of this denomination of Northern Kentucky. The Henry Clay of his church, his name will fall on hearts of the oldest of the church with reverent memory. Rev. James Spilman, of Alexandria, whose only education was gleaned from the study of his Bible, will ever be remembered as a man of God. Rev. William Stillwell, a pastor of the church in the fifties, one of the most amiable and lovely Christian characters, should not be forgotten. The old church on Bellevue Street lives in the memory of the people of the new church, as does the work of those noble ministers. About the year 1880, Rev. G. M. Shott, a young minister full of life, energy, and ambition, was called to the pastorate of the church. He presented to his congregation the need of a change of the location of the church edifice, and enthused his congregation with his active spirit of enterprise to such a degree, that the property on Bellevue Street was disposed of and the Congregational church secured in which the Baptist church have assembled for worship until the present enterprise was inaugurated. The purchase of the property on which the new edifice now stands in '81 (1881) was regarded by many at the time as simply hazardous and yet before Mr. Shott's pastorate closed every dollar of the obligation against the property had become liquidated. After Mr. Shott, came the Rev. J. G. Bow, who served the church as pastor for 5 years. Rev. R. B. Mahoney followed Rev. Bow as pastor, but on account of ill health, was compelled to resign the charge at the end of 11 months. Three years ago, the present pastor, Rev. G. W. Ferryman, was called to take charge of the affairs of the church, and under his administration and by the combined assistance of his auxiliary societies, Newport has added another to the laurels of her beautiful churches. During the first year of the pastorate of Rev. Ferryman, the subject of a new church was touched upon, but the time was not ripe for unity of action, and after an interval of one year of the present pastorate the matter was again taken up. After a short discussion a unanimous vote was put on record to build a new house of worship, but a year elapsed, and during the time the leaven had indeed leavened the whole lump. The Spirit of enthusiasm pervaded the congregation. Last May the former building was removed from its foundation, but yet to be preserved as a house of worship it was replaced on foundation of the Walnut Mission. The work of the new building was commenced at once and pushed the remarkable success, and not until last evening could the new house be said to be completed. The architects, S. W. Rogers & Sons, have reason to be proud of the design. There is not in the structure, from foundation to the spire, an abrupt or course feature, but every detail is in symmetrical proportion. The utmost harmony and taste prevails all parts of the presentation as it greets the vision, and as one proceeds with the inspection the more he is impressed with the excellence of design as to convenience and adaptability. The doors of the main entrance are sliding and never in the way; the floor of the first vestibule is of cement; the stairway converging in the center from either side admit through the second doors to the auditorium. The entrance to the gallery, as it should be, is by way of the auditorium. Once in the gallery, and looking down upon the grand room, one cannot but be impressed with the perfect repose and beauty of the scene. The ceilings are utterly void of any angles, but rise to their heights in beautiful curves, rendering the acoustic properties perfect. Whatever may be education, prejudice, or belief, in viewing the church from the gallery the sensation of the deepest adoration and worship steals unbidden over that beholder. One of the most forcible features of the large hall is the arrangement of the pulpit and baptismal front. The pool may be screened from the audience by a large panel or a rich drapery. When both are aside, a lovely river scene in oil is displayed, suggesting the natural conditions of baptism by immersion. The seating capacity of the auditorium as provided for in the twenty rows of circular birch pews neatly cushioned including the gallery, is near 700. The pews of the church cost in all $1,000.00. The whole amount was raised by the Ladies' Building Fund and every dollar has been paid in full by them. Mrs. Helen Howitt is President of the Ladies' Building Fund Society. The pipe organ presented by the Young People of the congregation cost $1,200.00. Hays Skaver is President of the Young People's Society. The pulpit furniture, of heavy dark cherry, richly upholstered, was presented by the Mite Society. Mrs. Crawford is President. The arrangements for light are most excellent - the combination of gas and electricity. The windows are all of cathedral glass, beautiful in design, adding largely to the general aspect of restfulness so desirable in a house of worship. One peculiar and excellent arrangement is the entrance to the gallery, which is by way of the auditorium. The Sunday School room on the floor below the main hall is provided with a separate entrance from the street and is arranged that it can be divided into four rooms by the noiseless rolling partitions. The room is provided with comfortable chairs and will seat in all near 400 people. In the rear of the Sunday School room are two rooms, one is utilized as the pastor's study, and the other the ladies' parlor. The combined heating and ventilating apparatus is the most approved pattern. The carpeting is all of the most serviceable made and of gentle color. The whole structure, which has grown to it present magnificent proportions is so short at time, is estimated at $22,000.00. The beloved and honored pastor of the congregation, that has wrought so great a work with unassuming grace and becoming modesty, "boasts not of himself" but with a heart, whose every pulsation is gratitude, pays the highest tribute of love and honor to the people of his flock for their constancy and unity of action in the accomplishment of the end, for which pastor and people have labored so faithfully. Among those who are entitled to honorable mention as supporters and directors are John S. Ducker, the well-known attorney, whose prosperity has intensified his deep affection for his church; Mr. Robert Howitt, who superintended the general work of construction, has made for himself a large place in the hearts of the people, by his valuable service; James I. Ware, the well-known merchant, has in means and influence, contributed largely to the success. These, with such men as J. F. Fye, A. J. Davis, S. H. Bennett, Louis Gosney, D. B. Yelton, Edwin Smith, Chas. Dash and H. C. Gosney, constituted the General Board of Managers. The builder, Mr. R. M. Harris, says never in all his experience of building did he have so little trouble. The woodwork is all finished in oil and varnish and presents an exceptional neat and tidy appearance. Much more could be said, much more ought to be said, but no more fitting thing could be said than that the pastor. Rev. G. W. Ferryman, so dearly beloved by his people, is to the same degree honored by the people of Newport as a Christian gentleman, a faithful minister of the Master, and an honor to the clergy of the city. The dedication Service will be held at 11 a. m. tomorrow. An exceptional selection of music has been arranged for the occasion. Mr. J. J. Hetsch, the organist of the Salem M. E. Church, will preside at the organ. The sermon of the occasion will be delivered by the Rev. T. T. Eaton, D.D., L.L.D., of Louisville, The Rev. Dr. W. P. Harvey of Louisville, will preach in the evening and the Rev. A. J. Harris, of the Dayton Baptist Church will assist the pastor in a series of revival services every evening next week.